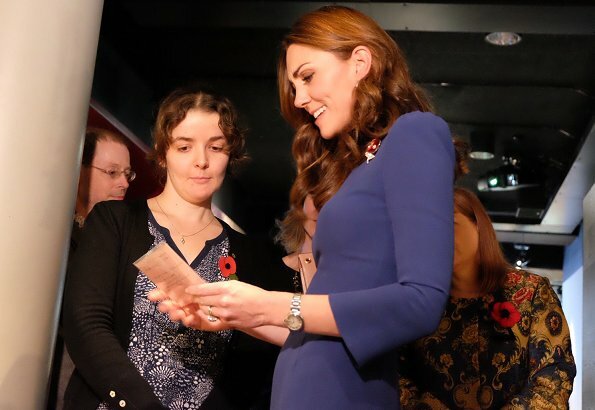 On October 31, 2018, Catherine, Duchess of Cambridge visits the Imperial War Museum in London. 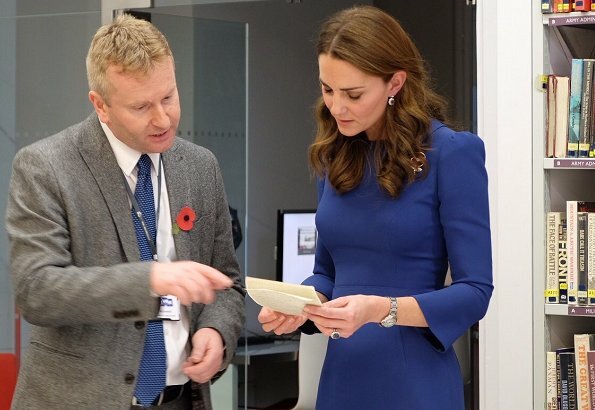 The Duchess visited the Imperial War Museum to view letters relating to the three brothers of her great-grandmother, all of whom fought and died in the First World War. These documents form part of the Imperial War Museum’s document archive, which provides a means to research, reflect and remember the extraordinary contribution and sacrifice made by so families during the First World War. And again: how slim she is! But she looks wonderful. I think she is looking beautiful and her figure is perfect. The dress is a bit too long what makes her legs looking shorter than they are. What a lovely dress - love the shade of blue and the style, the length is perfect. She looks a little tired but I think she naturally has dark circles under her eyes which can look a bit exaggerated because of how she wears her eyeliner. 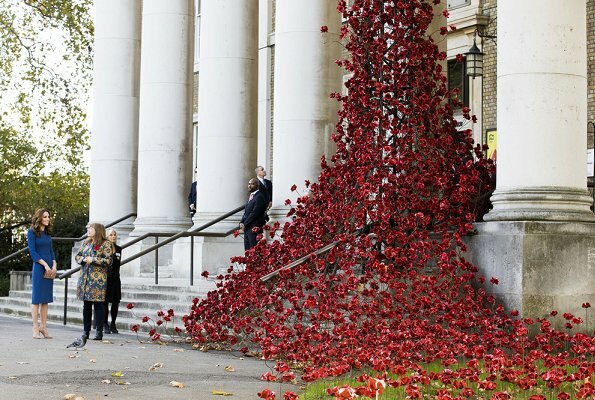 Slight shame her poppy is hidden by her hair especially on this visit but these things happen. Nice to see her back on duty. Kate has very good figure but this model does not flatter her. She could look amazing if the dress have a little more volume. And the leg of mutton sleeves makes the dress look boxy. Her hair is very nice. Such a treat, two days in a row of engagements now that her maternity leave has ended. Catherine looks great! She looks healthy and rested. Dress is such a pretty shade of blue, fits perfectly and is so classic. Her hair is also styled very nice. I fully agree with Anon 11.54 she looks very nice, nice dress etc I cannot understand the objections, widely unjustified in my view bearing in mind the lovely general impression given by her outfit and hair... Perfection does not exist, please reemember that. Dress fits perfectly and color is flattering. Catherine's family lost 3 Great Uncles in WWI, so it's good to see her on this respectful visit. Am I the only one that thinks she very very thin? I know she runs and works out but this is the smallest I recall her being. I saw a photo of her walking forward and I....gasped. I AM NOT SAYING SHE IS NOT EATING. Just super thin. I do love the dress and she looks happy. I agree. The dress is beautiful and I love her hair but her thin body reminds me of a bulimic Diana in the 80s. I hope all is well at home. Some say that she is slim/thin like that because she is tall and athletic. Yeah, i agree that she is tall & athletic but i think she looks best when she has more weight on like her appearance during the trooping 2018. But anyway, as long as she is healthy and all, then that's ok. Yesterday in the black I was thinking... not good not good...not good. She is thinner than she had ever been. I suppose with exercise and 3 little ones that might help ....but. I am not saying she has eating issues because she has always been health conscious. Actually she is more slender than she was at her wedding. Yes Diane I also thought that. But she looks well and happy so I hope that is the case. @gabriella This is not the first time you have suggested Kate is anorexic. Yes she is thin, but it is very harmful to throw that word around. Just as there are people that will always be genetically predisposed to be curvier like Beatrice and Eugenie, there are people that are genetically predisposed to be thinner like Kate and her sister Pippa. My mom had four children and left the hospital in her regular clothes all four times. She had zero baby weight. She has been told her entire life to gain weight. It is in her genetic makeup. Imagine not being able to find clothes small enough off the rack. I have a sister that had the same problem. Genetically, we are all very small. People don't think their comments can bother us because we aren't overweight, but they are just as hurtful. Diana's appearance was scrutinized daily, and she developed an eating disorder. Sarah was called the Duchess of Pork. I think William is very savvy and protective of Kate, and will know if something is wrong. The young royals have also made it clear that they have no shame seeking help for mental health issues. If Kate needed help, I am sure she will have plenty of support. Speculating about something we have absolutely no proof of serves no useful purpose. @Anon 2:28 I acknowledged Diana's problems above. Making constant comments, especially suggesting that she has an eating disorder, is not helpful. None of us knows what is going on. William knows full well what his mother went through--being scrutinized daily and not having much, if any, support. If there is a problem, William will not turn a blind eye to it. Kate also has a very loving and supportive family. As for Kate's weight when she was in school, it is not at all surprising that she was heavier at that young age. That is pretty common. As we age, we tend to thin out. I am not saying she has or does not have a problem. I am saying there are many reasons that she could be so thin right now. I am putting my faith in William and her family if there is a problem, and her doctors if she has a medical issue. If there is nothing wrong, she has good genetics and she is a very busy mommy of 3 that is known to eat a very healthy diet and excercise. Let me say it from my perspective. I'm very thin person myself all my life and I eat normal and healthy. But if I had a more strenuos period behind me I have allways lost some weight. And there were few who asked if I'm anorexic. Someone who has difficulties by losing weight just can't understand that it can be so easy for some other people. We are different and let's keep it that way. It's OK to have some observations about other people but not to make conclousions out of that. Masha, lucky you, I envy you! Thank you so much, Masha. You explained it perfectly. I wanted to add my perspective regarding Kate’s weight. I, too, like many of the posters here would be considered naturally thin. It was always hard for me to put weight on. And after having a baby boy, when many people might retain weight, I was back to my pre pregnancy weight within two weeks. However, it didn’t stop there. My son’s appetite was voracious and with breastfeeding, I simply couldn’t keep the weight on. By the time the baby was 6 months old, I weighed what I did at age 14 but the baby was in the 90th percentile for weight! It was unsettling but I wasn’t trying to get that thin. It was the stress of motherhood, breastfeeding, taking care of other children and a MIL who lived with me but didn’t lift a finger. I know Kate has help, but I seriously think nursing Louis and juggling two other kids has melted the weight off. She’ll find her equilibrium with time. She looks great. 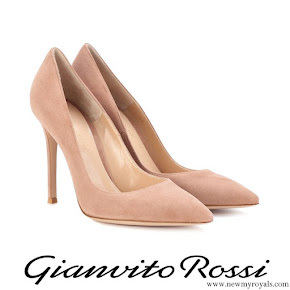 The dress is impeccably tailored. 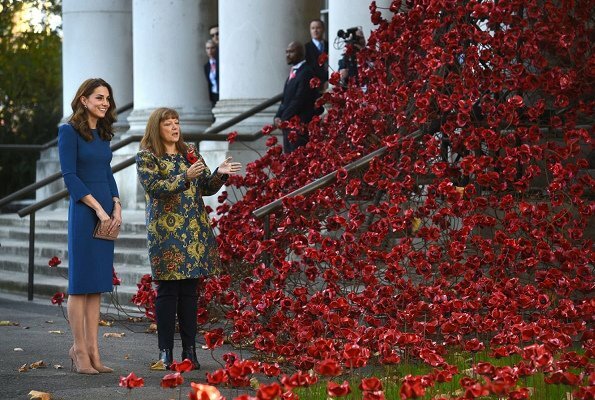 A treat to see the Duchess again and she looks fantastic in this lovely blue dress. What a beautiful colour it is. I don't think she looks tired at all and agree with Anon 11 54 that she looks relaxed and healthy, though very thin.It must have been an incredibly moving visit given the details of her relatives that are on display--the family lost all three sons. How unimaginably tragic. She has enormous bags and shadows under her eyes - hence my comment about looking tired. the colour of the dress is fantastic and I like the shape a lot. Is it the dress we saw before in another colour? can't describe the colour right in english, someting between light pink and lila? The dress, we saw first in Germany and again a view weeks ago? She wore this dress when they went to Australia. Gorgeous. Sorry Anna I meant Canada. You are speaking of the lilac dress in Germany that she wore the day? I think they are similar but sleeves are different. I think. This dress does look similar to another dress. Kate does like to stay with successful styles. I do hope we see her in more variety going forward. She looks great in so many things. 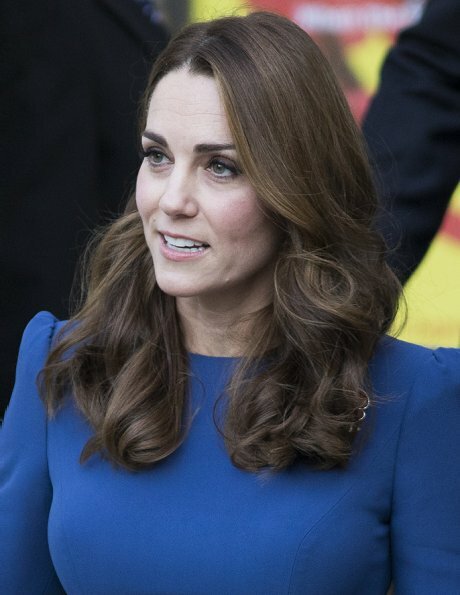 I know there are a lot of comments about Kate looking tired lately, but I don't see it. I am not really concerned about her weight either. She has been thin for many years. Women who breastfeed lose weight faster, and she has always been a healthy eater and physically fit. Being on maternity leave gave her the time to focus on getting herself back in shape. She also runs after 3 little ones. That alone keeps her very active. Yes, you are right about the dress, the other one was Wickstad as far as I found now. There are differences in sleeves, collar and the belt is thinner at the blue dress. But they look very similar. I like this blue dress really a lot, she looks fantastic with it, now, and also when they where in canada. From what I recall, the Duchess has always had this kind of body. Wouldnt have reacted that anything is unnormal now. She looks great! Besides, why no comments about Letizia and whether she eats too little? She is even thinner than Catherine. Looking at her before her marriage when she was at uni Kate had an athletic figure - she certainly wasn't heavy but she wasn't exceptionally slim like this either - this is not her natural shape. The tired look is most likely a result of dieting - the body takes the price somewhere. I've seen a number of comments about Letizia's physical looks some within the last weeks. 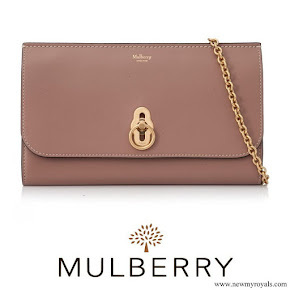 Like those who say only Meghan's fashions are criticised - following this site closely shows that's not true. In general, I prefer to overlook personal matters - but as someone who saw Diana go terribly thin - the public who whispered about it - no social media then - but also excused it as is being done here - I'am not sure just saying its natural is the best thing. 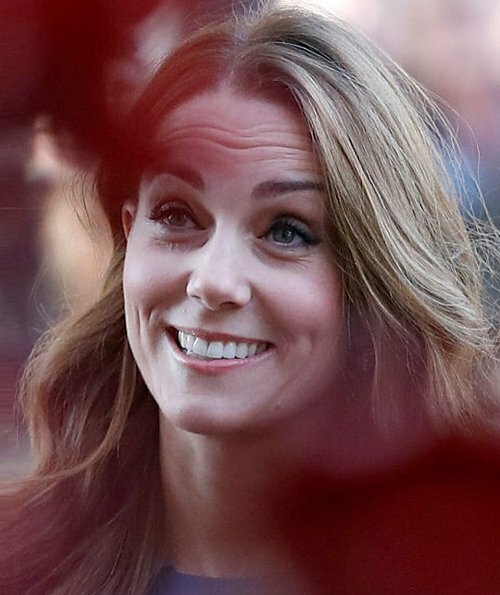 If nothing else - it's not a healthy or realistic goal for young women who follow the duchess or for new mothers. Happy to see her again!! For me she looks absolutely stunning, this is how a Duchess should dress herself. She’s beautiful and this shade of blue is wonderful for the season and for her complexion. Que interes hablar de Letizia aqui ? Es evidente esta delgadisima, la veo cansada, quizas porque son fotos no retocadas. Me gusta Kate , me gusta su vestido, pero por favor que no adelgaza mas. Kate could look so much better in not-so-tight dress model. This style underline how straight figure she has. She looks thin but so elegant. Her hair is marvelous!! I think it is a question of genes and hormones. Some loose and some gain weight after each baby. To me Kate looks just perfect. Great dress and color. She looks fantastic. This reminds bme of the Lavender Emilia Wicksted dress she wore to the Mental Health Summit, except that one has a flared skirt. I think she looks great in this style too. I do wish she would wear slightly shorter hems. Maybe right above the knee. She has nice legs and the longer skirts seem more matronly to me. Oh sympa cela, reste à espérer que vous échapper à cela!